The AEX800 is a half-length PCI-Express 1.0-compliant, 8 port analog interface card. It supports combinations of station and/or trunk/line modules for a total of eight (8) interfaces. Use the telephony card selector to identify a card that fits your requirements. 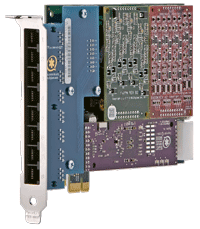 Like our PCI-based TDM800P, the AEX800 provides an industry first with 8 standard two-wire, RJ-11 interfaces on a single card bracket. This eliminates the need for multiple brackets, external dongles, or splitters. In doing so, the AEX800 reduces part complexity, cable clutter, and points of failure. The optional VPMADT032 hardware echo cancellation module provides 1024 taps (128 milliseconds) of echo cancellation for superior echo cancellation on both types of analog interfaces. If the hardware echo cancellation module is not installed, the AEX800 may be used in conjunction with Digium's High Performance Echo Cancellation (HPEC) software, a commercial and toll quality hybrid echo cancellation solution. Digium's HPEC provides 16ms to 128ms of selectable near-end ITU G.168 compliant echo cancellation in software. Using this card in concert with Digium's Asterisk® software, standard PC hardware, and the Linux® OS, you can create SMB or SOHO telephony environments capable of satisfying the needs of small or medium business applications at an industry-leading price.